Horwin PRF-V/UM6-x series is a compact “band pass – band reject” filters based on a 6 full size quarter wavelength resonator on UHF and helically on VHF. 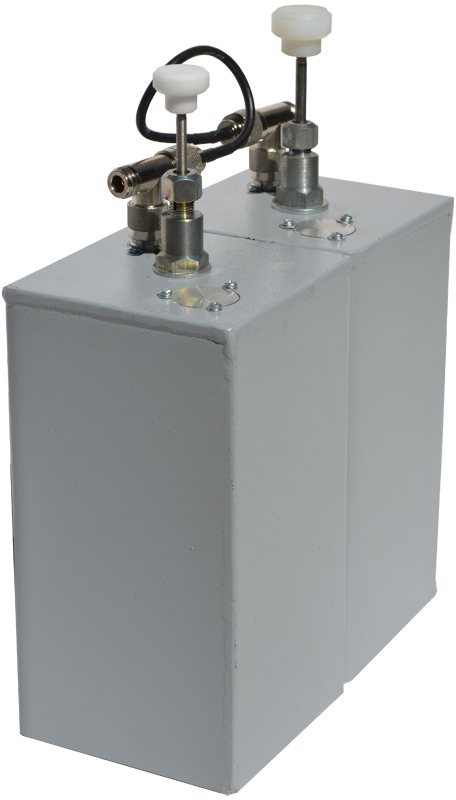 This filter types can be used to protect a receiver against interference from a nearby transmitter. Pass/reject filters are irreplaceable when the spacing between RX frequency and the interfering signal so small, that the slop of normal pass filters or reject filters are not sufficient to provide adequate rejections. Filters allow to handle up to 50 watts power. Filter nominal impedance is 50 Ohms. N-type “female” connectors are used for input/output connections. The filter’s cavities are made of extruded aluminium. All coaxial cables used are semi-rigid silver plated. Cables and connectors are with PTFE insulation. Filters are covered with black polymer powdered coating. Filters are tuned for customer specified “pass” and “reject” frequencies and no further adjustments should be required. Horwin PRF-V/Ux-x series is a “band pass” filters based on a quarter length 5 or 8 inches width square cavities. The use of large cavities provides a high input power rating and means high Q, resulting in a very narrow pass band. Filters allow to handle up to 200 watts power. There are one, two, or three cavities filters available. More cavities provide greater selectivity and, when required, a wider pass-band. Filter nominal impedance is 50 Ohms. N-type “female” connectors are used for input/output connections. Cavities are aluminium made with 5 mm thick top plate welded to the cavity body. Inner conductor and coupling loops are silver plated cooper made. Central tuning road is invar made. All this provide excellent frequency stability in temperature range from – 30 to + 60 C°. Filters are tuned for customer specified frequencies and no future adjustments should be required. If frequencies changes became necessary cavity pass frequency may be adjusted by tuned road and pass width by adjustable coupling loops. Horwin PRF-V/Ux-x series is a “band pass – band reject” filters based on a quarter wave 5 or 8 inches width square cavities. The use of large cavities provides a high input power rating and means high Q, resulting in a very narrow pass or reject spacing. Filters allow to handle up to 200 watts power. There are single or dual cavity filters available. More cavities provide greater selectivity and, when required, a wider pass-band. Filter nominal impedance is 50 Ohms. N-type “female” connectors are used for input/output connections. Cavities are aluminium made with 5 mm thick top plate welded to the cavity body. Inner conductor and coupling loops are silver plated cooper made. Central tuning road is invar made. All this provides excellent frequency stability in temperature range from — 30 to + 60°C. Filters are tuned for customer’s specified frequencies and no further adjustments should be required. If frequency changes become necessary cavity pass frequency may be adjusted by tuning road and reject frequency by adjustable coupling loop and tuning capacitor. Horwin RF-V/Ux-x series is a reject (notch) filters based on a quarter wave 5 or 8 inches width square cavities. The use of large cavities provides a high input power rating and means high Q, resulting in a very narrow pass or reject spacing. Filters allow to handle up to 200 watts power. There are single or dual cavity filters available. More cavities provide greater rejecting, when required, a wider notch. Filter nominal impedance is 50 Ohms. N-type “female” connectors are used for input/output connections. Cavities are aluminium made with 5 mm thick top plate welded to the cavity body. Inner conductor and coupling loops are silver plated cooper made. Central tuning road is invar made. All this provides excellent frequency stability in temperature range from – 30 to + 60°C. Filters are tuned for customer specified frequencies and no further adjustments should be required.